If you just can’t wait for the cold dark nights of November to endanger yourself and all your friends with some irresponsible back garden pyrotechnics then we’ve got something which should keep you busy until then. 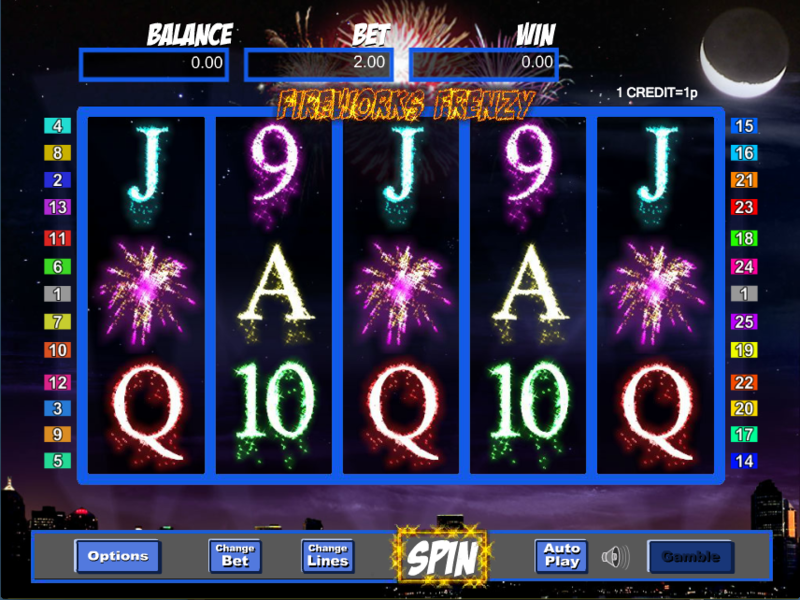 Fireworks Frenzy is an online slot from Eyecon with some pretty graphics, a bonus feature and an opportunity to gamble your winnings; read the full review below for more information. 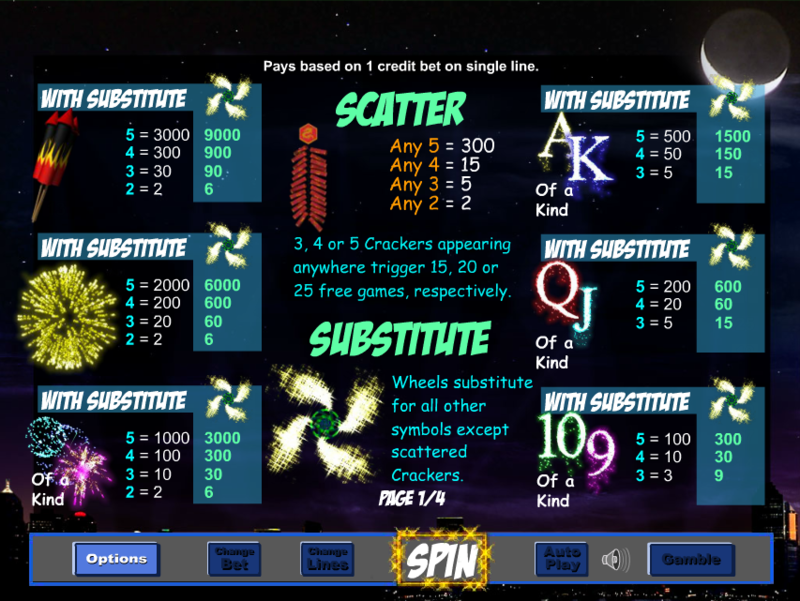 Fireworks Frenzy is a five reel slot with three rows and up to twenty five paylines; the backdrop to the reels is a huge expanse of night sky with fireworks exploding in front of a crescent moon. Right at the bottom is a silhouetted cityscape taking second stage to the action above. There are just three high value symbols including a set of rockets, a yellow single explosion and a multicoloured explosion; 9, 10, J, Q, K and A make up the lower values but these symbols look like they’ve been created with sparklers. The wild symbol is a catherine wheel which substitutes for all others except the scatter – it will also multiply by 3x any wins to which it contributes. The scatter symbol is a set of Chinese crackers which activates the feature. During the spins the wild symbol will expand to cover all positions on the reel, helping out with some winning combos; it also multiplies any wins by 3x. Each base game win can be gambled by clicking the ‘Gamble’ button underneath the reels; it’s a choice between two options to double your money but get it wrong and you’ll lose it all. Fireworks Frenzy is a little long in the tooth now and it’s showing it’s age but you may want to give it a crack if the mood takes you; there’s nothing really wrong with it and it has an RTP 94.94%.